If Ai Weiwei, the much admired Chinese dissident artist, were a character in a novel, I would know exactly what to think about him. I would regard him as a fascination, at once formidable and absurd, courageous and disingenuous, unquestionably brilliant and downright moronic. I would take in stride the outlandish paradoxes that are integral to his reputation. I would cheer his stirring advocacy of the victims of Mao’s successors and recoil at the terrible brain injury he suffered at the hands of the Chinese police, while discerning a streak of ugly nihilism in some of his best-known artistic acts, such as smashing an antique pot for a photographic triptych titled Dropping a Han Dynasty Urn and dipping Han dynasty vases in garishly colored industrial paint for a work known as Colored Vases. I would go wherever the novelist who had invented this fierce, funny, bearded, barrel-chested impresario wished to lead me, and in the end I would have a tremendous picture of a man with a quick mind, indomitable energy, and no particular aptitude for art. I wish I could leave it there. But of course Ai Weiwei is anything but a fiction, and the contradictions between his life and his art—and perhaps within his art as well—are as real as real can be. He is currently the subject of a large exhibition called “Ai Weiwei: According to What?” at the Hirshhorn Museum in Washington. My sense, at least on the weekday when I visited the show, was that visitors welcomed the opportunity to focus on the hardships of life in contemporary China as well as on Ai’s extraordinary courage as a social activist. Although some museumgoers may be surprised to discover that Ai often favors a chaste minimalist style as he spotlights some of the horrors visited upon the Chinese people by the country’s authoritarian regime, others will take the style in stride, regarding it as a generic documentary approach perfectly appropriate for Ai’s torn-from-the-headlines subject matter. Certainly one need know nothing about Robert Morris and Donald Judd and the other 1960s artists from whom Ai takes many of his formal strategies to get the point of Straight. This arrangement of steel rebar recovered from the rubble of collapsed schoolhouses in Sichuan, following the earthquake in 2008 that killed more than five thousand children, is strikingly austere. Ai has been an outspoken advocate for the children’s parents as they seek at least some modicum of justice. At times the Hirshhorn exhibition is close to pure documentary. There is a list of the names of the children who died in Sichuan posted on a wall. And Ai includes an ink-jet print of an MRI of his brain, after his beating by police in 2009. In the face of such facts, some will wonder if there is any point in discussing the art historical background or in determining exactly what belongs in an art museum. At this late date, wouldn’t only a philistine question whether a list of names or an MRI of a swollen brain counts as a work of art? A work of art is whatever anybody says it is. Why even bring it up? I admire Ai’s courage. As the son of a well-known poet who suffered enormously during the Cultural Revolution, he is perfectly aware of the dangers of confronting a powerful regime that has little or no interest in human rights. 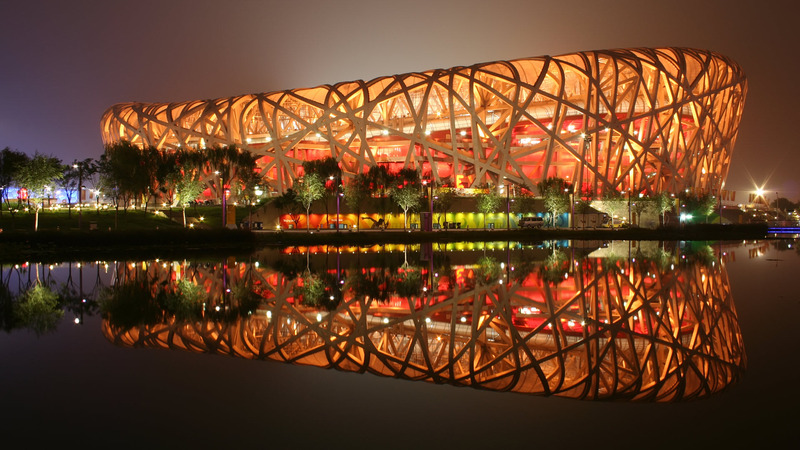 In the months leading up to the Beijing Olympics in 2008, Ai was something of a political insider, working with the architectural firm Herzog & de Meuron on the design for the Bird’s Nest Stadium. But even before the Olympics opened, Ai had become an outspoken critic of the regime, using whatever partial protection his international fame accorded him at home to shed light on the darkest corners of contemporary China. Since then he has been hounded, investigated, jailed, and refused permission to leave the country, but not silenced. Ai’s meditations on the nature of modern culture can also sound strangely old-fashioned, their talk of “humanity” and “spirit” a bit fulsome to Western ears. And here we come to the poignancy of Ai’s situation. While Ai’s socially engaged art has emerged in a country where modernism has never taken hold, he finds his most responsive audience in the West, where the core principles of modern art–its fervor, its independence, its individualism–are increasingly imperiled. So Ai turns out to be both pre-modern and postmodern, which probably explains how neatly he fits into our current artistic free-for-all, uniting as he does an early modern evangelism and a postmodern irony. Invited to contribute to Documenta 12 in Kassel in 2007, Ai dreamed up Fairytale. This quintessential work of social engagement involved bringing to Kassel 1,001 Chinese citizens who under normal circumstances had little or no chance of ever leaving the country to spend some time in Germany. Were these Chinese citizens being turned into a living work of art–a kind of performance piece? Was Ai liberating them, or using them as pawns in his own bid for fame? The novelistic possibilities are endless, suggesting an exploration of the vanity of good works worthy of Dickens or Tolstoy. With socially engaged art now a global phenomenon, some practitioners worry that the “activist art milieu” is all too often “simply digested by the conditions of power,” as Nato Thompson puts it in a new book, Living as Form: Socially Engaged Art From 1991-2011 (MIT Press). I imagine that Ai’s Fairytale might be open to this line of criticism. In the context of the localized cottage-industry character of a lot of socially engaged art, Ai has set himself apart by taking as his canvas a country even larger than Russia, which was in some sense the very starting point for modern political art, when once upon a time Tatlin, Malevich, and El Lissitzky imagined that they might unite radical art and radical politics. Remembering how the Russian avant-garde was crushed by Lenin and then expunged by Stalin, Ai’s supporters can hail him as the inheritor of the socially engaged avant-garde, now rising against the inheritors of Mao’s China. Which is not to say that Ai will not meet some resistance on the left, where his taste for the bold gesture may not sit entirely easily with those who disdain the international art world’s addiction to spectacle. The Hirshhorn has recently purchased Ai’s more than thirteen-foot-high Cube Light, which, with its row upon row of jazzily back-lit gold-toned crystals, suggests the retro-glam décor for an upscale bar or nightclub. While a wall label explains that Cube Light “interrogate[s] conventions of culture, history, politics, and tradition,” it seems to me that the only reasonable response to this caramel colored concoction is to order a martini and make it extra dry. I confess that Ai lost me completely with Cube Light, part of what the people at the Hirshhorn refer to as his “celebrated chandelier series.” The glitz of Cube Light reflects a side of his sensibility that some progressives will dismiss as high bourgeois kitsch, although at times it is unclear whether Ai is parodying a taste for swank Chinese porcelains and beautifully crafted wood furniture or celebrating it. The truth is that he may not be entirely clear about this himself. Ai is probably at his best when he works as a designer, considering form in its social aspect. 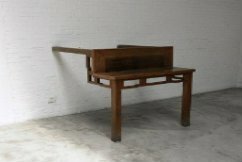 From what one can gather from photographs, the studio that he designed and built for himself in Shanghai—which the authorities bulldozed in 2011—was eloquently straightforward, in a style reminiscent of some of Judd’s architectural works, of which Ai is surely aware. In recent years, one of the most attractive aspects of Ai’s activity has been his engaging various craftspeople—especially workers in wood and ceramic—to create works that Ai designs but hands over to others to produce, in keeping with tried and true post-Duchampian practice. At times he suggests a Dadaist William Morris, corralling skilled woodworkers to make absurdist constructions out of antique tables, stools, and doors, or overseeing the creation of millions of tiny porcelain sunflower seeds that filled the Turbine Hall at Tate Modern in 2010—the seeds evoking the Cultural Revolution, when the Chinese people were said to be sunflowers turning toward Mao even as the seeds themselves provided much needed nourishment. Whatever the admirable consistency of Ai’s stand against the Chinese regime, when it comes to art he is a little too fond of jokes and ironies that have a way of multiplying into inanities. Could it be that the 1,001 Chinese citizens he brought to Documenta were somehow regarded as readymades? And to the objection that nearly everything he has done seems a version of something already done by an American artist—whether his boxes that suggest Judd’s boxes, or his ambiguous furniture that suggests Richard Artschwager’s furniture, or his piled pieces of steel rebar that bring to mind Robert Morris and Carl Andre—would he reply that this is precisely his point, that the American “original” idea becomes for him a readymade? And when he breaks or otherwise transforms what we are told are genuine antiquities, is this his version of what Duchamp once called a “readymade aided”? So why, you might ask, did he go to the trouble of creating replicas or reconstructions of these heads, which have now been exhibited in London, New York, and Washington? Asked more recently about the project, Ai had this to say: “Because the Circle of Animals/Zodiac Heads is animal heads, I think it’s something that everyone can have some understanding of, including children and people who are not in the art world. I think it’s more important to show your work to the public. That’s what I really care about. When Andy Warhol painted Mao in the 1960s and 1970s, I don’t think many people understood Mao, either—it was just this image that people knew, like Marilyn Monroe or somebody. So they might see these zodiac animals like that—like Mickey Mouse. They’re just animals.” Ai may be a hero when it comes to speaking out for the victims of the Sichuan earthquake, but when he talks about his art he is jeeringly manipulative. It is hard to have patience for an artist who justifies his work with references to Mickey Mouse. Much of the fascination of a substantial survey of an artist’s work consists in the ways it deepens our understanding of origins and evolutions, but the Hirshhorn exhibition offers only the sketchiest sense of Ai’s early years. The problem may be that his artistic beginnings are pathetically thin, at least that is what I surmise from the little early work included here and what I have seen in reproductions. As a young man Ai spent a decade in New York, from 1983 to 1993, returning to China when his father became ill. At the Hirshhorn a good deal of space is given to photographs he took while hanging out in Brooklyn and on the Lower East Side, and they are nothing more than the snapshots of a somewhat aimless fellow: he meets Allen Ginsberg, witnesses the Tompkins Square Park riots, passes the time with friends from back home. One work from those years that has received some attention—although it is not in the Hirshhorn show—is a wire coat hanger that Ai manipulated so as to replicate the profile of Marcel Duchamp as seen in his Self-Portrait in Profile. What other work there is from the 1980s strikes me as only more of this highly diluted Dadaism: Château Lafite, a bottle encased in two shoes; a book with a half of a shoe attached to it; a violin with two shoes clamped to its body; and another violin with its neck replaced by the handle of a shovel. Is the shovel an homage to Duchamp’s readymade that consists of a snow shovel? Does the violin have something to do with Man Ray’s Le Violon d’Ingres? Or with the French artist Arman’s interest in violins? Whatever the answers, Ai’s Dadaism never strikes with a personal force, the way Robert Gober’s sometimes does. The work is pale and derivative, after which it becomes loud and political without ceasing to be pale and derivative. Although Ai is a darling of journalists and editorialists around the world, his work may be a little overly explicit for some connoisseurs of late modernism or postmodernism, better suited to Art and America and The New York Times than to the pages of October. I suspect that many museum professionals in Europe and the United States who have supported Ai’s projects also regard him with a slight condescension, as something of an artistic naïf, albeit an extraordinarily self-possessed naïf. His paradoxes lack the house-of-mirrors richness that is admired in Bruce Nauman’s Clown Torture videos, in Cindy Sherman’s recent photographs of aging upper-class suburban housewives, and in William Kentridge’s scratch-pad films. There is much that is blunt and programmatic about Ai’s ideas about the relationship between art and social action, which perhaps explains his appeal for the audience that only occasionally goes to museums and galleries and so admired his millions of sunflower seeds in the Turbine Hall at Tate Modern. For Ai, there is not even a question as to whether the artist can simultaneously be a social activist, because art is not a separate arena with its own laws and logic. All actions, whether compiling a list of children killed in an earthquake or dipping Han dynasty vases in industrial paint, are related in that they are expressions of “creativity.” Creativity, Ai explained in a blog post in 2008, “is the power to reject the past, to change the status quo, and to seek new potential. Simply put, aside from using one’s imagination—perhaps more importantly—creativity is the power to act.” What is lost in this talk about creativity and action is the ancient requirement that a work of art be realized in a particular medium. That does not seem to matter to Ai. Asked by an interviewer whether the millions of porcelain sunflower seeds at Tate Modern “relate[d] back to China,” he argued that “mass production is nothing new. Weren’t cathedrals built through mass production? The pyramids? ... Paintings can be painted with the left hand, the right hand, someone else’s hand, or many people’s hands. The scale of production is irrelevant to its content.” This is an extraordinary comment. If the scale of a work and the way the work is produced are irrelevant to its meaning or its content, then what on earth is a work of art? Isn’t a work of art by its very nature a matter of particulars, of size and scale, of who does what and how? When Ai complains that China has never developed a modernist culture, he surely regards himself as an exception. But the crudity with which he connects creativity with action and action with art reflects a misunderstanding of the nature of modern art, and indeed of all art, that is as pervasive in democratic societies as it is in countries with authoritarian regimes. Artistic crudity knows no national borders, and while I would never discount the importance of the freedom to create whatever an artist wants, I would insist that art proceeds according to laws that politics can at times thwart or control but never fully contain or comprehend. It is tempting to say, in summing up “Ai Weiwei: According to What?,” that I admire the politics and am left cold by the art, but that lets the art off too easily. When Ai hangs an MRI on the wall or places thirty-eight tons of steel rebar on the floor, he fails to meet, much less to grapple with, the challenges of art. In this way, he creates his own kind of political kitsch. It is not the kind with muscular working men that Stalin and Mao preferred, but it is kitsch nonetheless—postmodern minimalist political kitsch, albeit in the name of a just cause. The political causes that Ai embraces are noble. This cannot be said often enough. But when he takes his place inside the Hirshhorn Museum, with its Matisses and Brancusis and Mondrians, I cannot help but feel that he poses a threat to the artistic universe he dreams of inhabiting. This is not a question of left versus right, or of communist versus capitalist, or of political art versus art for art’s sake. It is a question of what an artist is actually doing when he makes a work of art. I am reminded of something that John Berger, himself a fervent leftist, wrote in 1978 in an essay called “The Work of Art,” arguing against a rigid Marxist interpretation of art: “When a painter is working he is aware of the means which are available to him—these include his materials, the style he inherits, the conventions he must obey, his prescribed or freely chosen subject matter—as constituting both an opportunity and a restraint. By working and using the opportunity he becomes conscious of some of its limits. These limits challenge him, at either an artisanal, a magical or an imaginative level. He pushes against one or several of them.” Berger is writing about a painter, but what he says holds true for any artist. What never happens in Ai’s work is this pushing against limits, this sense of the means as constituting an opportunity and a restraint. With Ai, the means are purely instrumental, just a way to get to an end. The trouble with most critiques of political art is that they pay too much attention to the politics. This is not to say that an artist’s politics do not matter; not at all. But the great challenge today, at least for those who find themselves in a museum wanting to take full advantage of what an art museum has to offer, is how deeply the artist is exploring the means that are available. Therein lies artistic freedom. As an artist, Ai Weiwei remains imprisoned, unable to speak in the language of forms, which is the only language an artist can really know. A novelist might make something exciting out of Ai’s predicament. But Ai, as I say, is not a character in a novel. He is a man who makes works of art. They are bone-chillingly cold, the thoughts or attitudes of a great political dissident who remains untouched by even a spark of the imaginative fire.